There are far too many reasons a client won’t buy your service. It’s vital to understand that for every reason a client should buy, there are probably 10 reasons they’ll find to convince themselves they should not. Indeed, in the majority of cases they’ll have a hard time explicitly stating the reason(s) they aren’t choosing you as a provider, reverting to a lazy stock response of “the timing isn’t great – but I’ll keep you in mind”. If this sounds familiar then you’re a victim of the ‘Subconscious Checklist’… but before I unload another unsolicited buzzword on you let me provide some context. Have you ever wanted something so much that almost nothing stood in your way? The dream car that took some intensive justification to your significant other. The house that started 50% over your budget but that you somehow scraped the funds to buy. Those shoes or that item of clothing you blew a weeks salary on only to wear twice? … the momentum of desire was unstoppable and the sale was inevitable. Have you also noticed that for the most part, it is you who convinces yourself to stretch to these purchases? Like a secret agent of the vendor nestling into your subconscious, convincing you that you NEED this item, reshaping the proposition every which way until it fits with your ‘let’s do this’ reflex. Sure, in some high-pressure sales situations a good salesperson can be the deciding factor but when we’re making big decisions and have time to ponder, desire wins out. Imagine how powerful it would be if you could bottle up that sense of desire and sprinkle it all over your proposals? It’s an opinion of mine (backed by practical tests in my own business as well as the freelance businesses I coach) that we send proposals a little too early… before the client really has had chance to desire what it is you’re going to propose. This is akin to launching into marriage proposals on the first date and will produce the same results you might be used to… a low proposal-to-win ratio. I’ve developed an entire course to overcome this, designed to help Pro members build rapport with prospective clients, establish (and leverage) desire then transition them into buying territory. I wanted to bring some of the highlight points out into the open though, to help you get some results-in-advance if you haven’t made the leap into Pro yet. 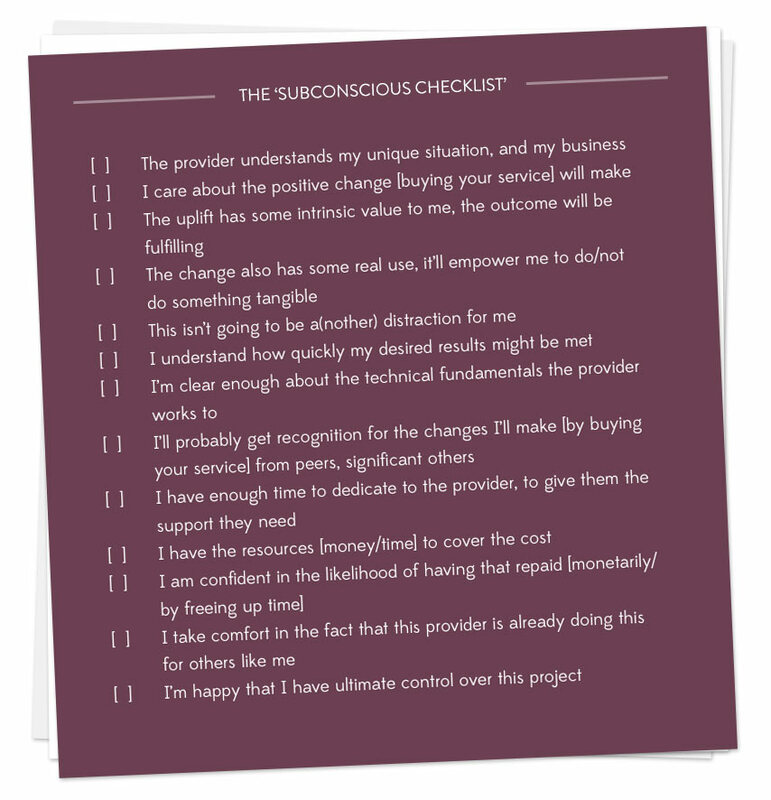 When making a decision to buy your service, the client will try and reconcile your offer against a number of key decision factors, something I call the ‘Subconscious Checklist’. This is a set of positive statements; the majority of which must be true in the client’s mind before they’ll even consider buying. This is driven by the same subconscious triggers that motivate us to buy anything. Your objective (before you raise the proposal) is to ensure your would-be client can ‘check off’ as many of these points as possible. As you can see, these are key arguments a client will be having with themselves as well as the others they will need to justify this purchase to. So how do you influence their opinion on these points? First, it’s important to understand that it’s your responsibility to provide the answers your prospective client is looking for. Catching up for a ‘chemistry meet’ via Skype? Overwhelm your client with how much knowledge you have about their business and the specific issues they’re struggling with. Sending an email to follow-up on a previous enquiry? Remind the client of the beneficial outcome they can expect from this project, and why they sought your assistance in the first place. 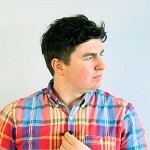 Interacting with the client on social? Why not drop the client a link to a relevant case study to give them subconscious assurances and comfort that you’re already providing results for people like them. Hopefully you can see where this is going, you should make it your mission to pre-emptively respond to the questions they’re not yet asking. I call this the ‘Pre-sale Slalom’ (sorry, more unsolicited nomenclature to learn). A deliberate, ordered series of touchpoints, communications and epiphanies for the prospect to experience. When combined, these experiences start to build the momentum of desire that’ll make the sale inevitable. By working your way down the ‘Pre-Sale Slalom’ before your proposal is raised, you’ll minimize the chances of a client rejecting, or not replying to your proposal. In the course and the book that goes with it I break these out into guideline communication exchanges you should have with a client before taking the dialogue into proposal / buying territory. Download the worksheet which breaks down the ‘Pre-Sale Slalom, to help you build rapport and maximize desire in your prospective clients before you get to the proposal stage. Click here to download the worksheet. Your objective before you hit send on that proposal is to ensure you’re 100% confident that most (if not all) of the ‘Subconscious checklist’ items are addressed in order that your proposal acceptance is no longer just ‘possible’, it’s ‘probable’. In closing, we’re all looking the best ‘voodoo magic strategies’ for pricing, how to justify value well and how to package that into an offer the client can’t refuse. But the fact is, when it comes to salesmanship we’re all often slightly too keen to go for the jugular; the killer pitch or in-depth proposal that’ll blow the client away. Without desire though all of that effort will be in vein and the client will likely go cold and unresponsive when they receive your pitch. Download the worksheet and refer back to the subconscious checklist to give yourself the best possible chance of winning the gig. I’ll be cheering you on. 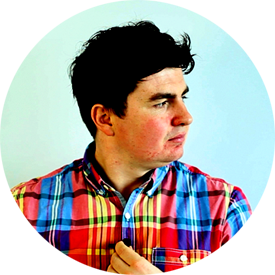 Liam, in 12 years mostly as a freelancer and now as Lead Designer of Venuto Creative, I am surprised that it has taken this long to see a resource like this. Your article is very inspiring. It removes the cold essence of “salesy-ness” that often couples marketing strategies, and replaces this with true merits of service: give people what they want. Thanks. Awesome – thanks for the words Eric… yeah you’re exactly right, how will you change the client’s life? Even if it improves their day-to-day by 2%, lead with that and ensure they truly desire it! I totally agree. I see a lot of freelancers, especially on Elance, etc. that love to flaunt their tech skills and how fast they work and how great their prices are. I don’t think any of that really works. As far as I can tell, clients just want to know they can trust you. They want to know they you “get them” and can see their vision, and can execute it. It’s all about personal relationships, not gimmicky sales stuff.